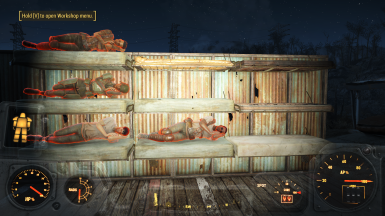 Separate bed frames and mattresses that can be snapped together, including bunk beds and double beds that can be used by two settlers. Abernathy Farm - Little Village BLUEPRINT for Transfer Settlement Main + Update file. Caladons Red Rocket Rest Stop Recommended - Won't break without these but they do add a lot to the Blueprint. Echo Lake Lumber Rebuilt V 2. Egret Tours Marina Little Port Optional, if you want use classic\vanilla, just remember there's almost 20 rooms to fill. Longfellow's Cabin Little Village Optional, if you want use classic\vanilla, just remember there's almost 20 rooms to fill. LucidLady's Soup Island Blueprint for Transfer Settlements. National Park Visitor's Center Little Village Optional, if you want use classic\vanilla, just remember there's almost 20 rooms to fill. Oberland Station Little Village Main + Update file. Optional, if you don't use it, you must replace the beds. Sanctuary Little Village For ALL beds. Somerville Place Little Place Optional, if you want use classic\vanilla, just remember there's almost 20 rooms to fill. Starlight Drive In Little Village Main + Update file. The Slog Little Village Optional, if you want use classic\vanilla, just remember there's almost 20 rooms to fill. Vault 88 - A little tiny vault...or not Main + Update file. Fix accidental replacement of cutting fluid recipe. CozyBeds fully integrated. No longer needs installed separately. 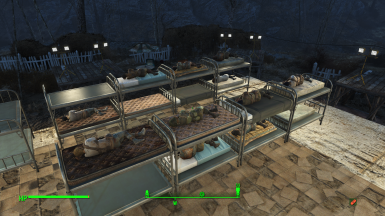 If you do not want CozyBeds mattresses, use Chem station to craft a toggle syringe. 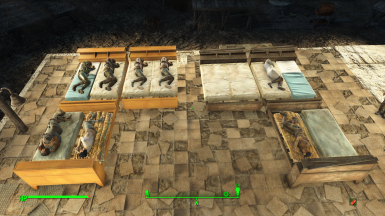 CleanBeds fully integrated. No longer needs installed separately. 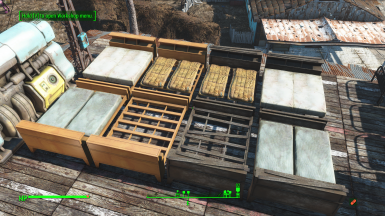 If you do not want CleanBeds mattresses and frames, use Chem station to craft a toggle syringe. Workshop menu is now done by script. This means no more conflicts or patches. However, you will need to use the Menu Toggle chem before uninstalling. Added a "worn" pre-war double bed. Allow mattresses to be snapped to wall cot from both directions, since they are unidirectional and wall attached. New mattress with sheets. 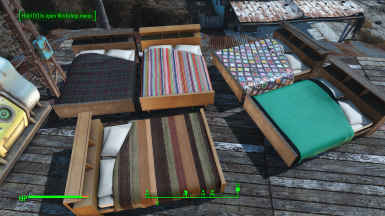 Size of normal mattresses but with sheet textures. Dirty and clean sheet versions. 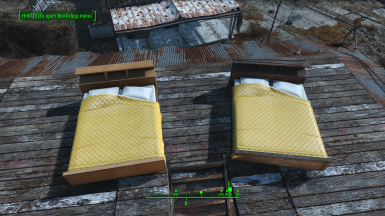 Fixed collision issue with pre-war double bed frame. Fixed missing workshopobjectscript on one of the child mattresses. Support for LupusYondergirl's Cozy Beds. 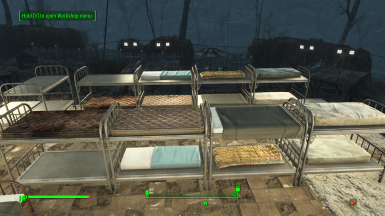 If you have Cozy Beds installed, you will gain access to 16 variations each of single, double and child mattresses. Integration with dgulat's Clean Beds. This adds many new frame, mattress and pillow variations. 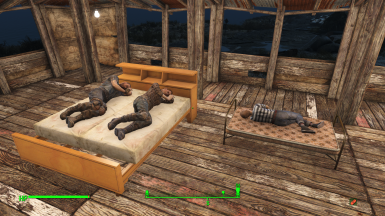 You must have Clean Beds installed to use the new variations. Fixed collision on dirty mattress and small dirty mattress. Added wall mounted bed frame. Added pillow and straw pillow, can be attached to mattresses. Added double bed Pre-war mattress halfs. Use them together to build the pre-war look. Renamed items to better sort in the workshop menu. Fix for a broken mesh for child mattress, which would cause a crash. Collision updates for all meshes. This will solve a few cases where player or NPC would stand on the air above a frame, and similar mishaps. No change to the plugin itself. Added double bed frames. 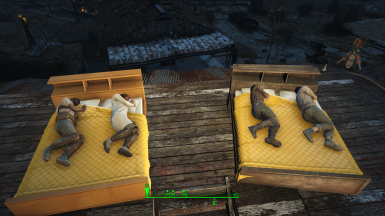 Note, they do not fit the full sized mattresses. 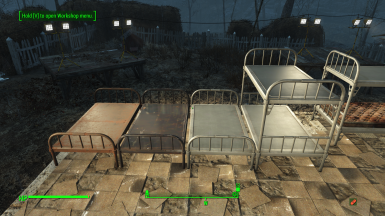 Added child usable beds. It's noted in the description of the mattress. 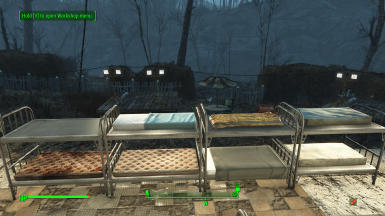 Added hospital bed frame. Note, it's a smaller frame, not all mattresses will fit. Added military cot bed frame. Note, it's a much smaller frame, not all mattresses will fit. 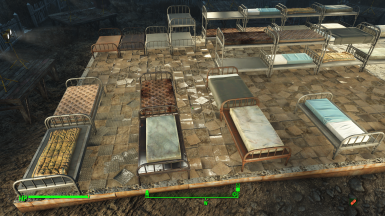 Changed the institute-based mattress to a better, wider model. 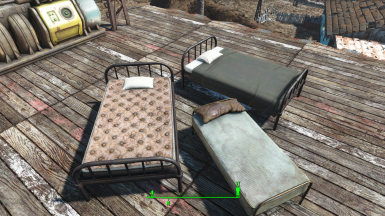 Fixed mattresses being able to snap to each other. Added bed frame snapping side-to-side. Added dirty metal bed frame and rusty metal bed frame. Four total frames now. 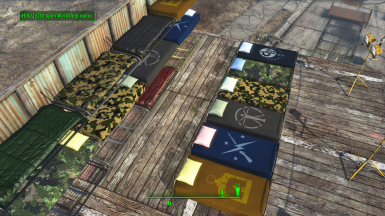 Added dirty mattress, stripped (Hospital) mattress, dirty sheet (Military) mattress, and sheet/blue blanket (Institute) mattress. Fixed bed frames attempting to snap to the mattress snap. Fixed bed frames snapping head-to-tail. Added single metal bed frame. Added mattress with no bedding. This started off as a weekend project to try out an idea I had for my own sake. 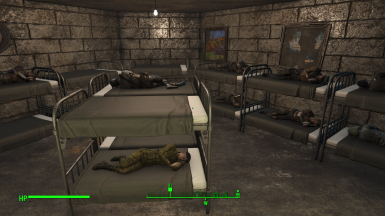 Several mods add bunk beds to settlements, and they grant 2 Beds to the settlement. However, they can only be assigned to one settler. 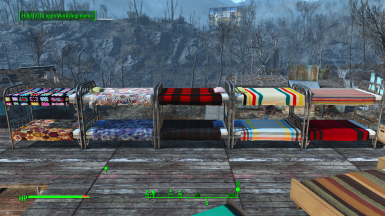 Some mods solve this by making all of the beds static, and adding pillows that act as beds. 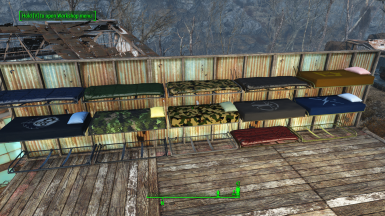 I wanted to try another approach, with empty bed frames that you could then place mattresses on. Under Furniture, I have added a new category SnapBeds. Inside you will find frames and mattresses. Build a frame, then snap in mattresses. You can mix and match. You can let the settlers assign themselves or do it yourself. Targeting some mattresses is a bit tricky as it will want to select the frame as well. The bed frames will also snap end to end and side to side, allowing you to arrange rows easily. There are currently three mattresses that support children. Children will NOT scale up if assigned to these mattresses. Check the descriptions while in workshop mode. This mod includes textures from dgulat's Clean Beds and LupusYondergirl's Cozy Beds. These are used for a wide range of different colored frame and mattress choices. You do not have to have Clean Beds or Cozy Beds installed. If you do not want to use these texture variations, there is a chem you can craft at the chem station under Utility that will toggle them off and hide them from the workshop menu. Should be compatible with everything. Before uninstalling SnapBeds, craft the "SnapBeds Menu Toggle" and use it. This removes SnapBeds from the workshop menu. You can use it again to put it back. Depending on where you build a bunk bed frame, the top bunk may not be "sheltered". It appears to consider how high above the mattress the roof is, and if the mattress is too close, it won't be sheltered. Try ensuring you have a tall roof above the bunk bed, or that it's on a lower floor in your structure. 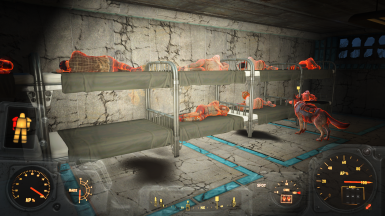 Or, try out ShelteredBeds, a small mod I created that forces the workshop to believe all beds are sheltered. I provide this information "as is" and take no responsibility if it does something odd to your game. Need to assign a child to his or her new bed? Workshop mode won't let you? Open console and select the child.